During the development of an embryo, every single cell needs to know what and where it is, and what it has to do. Polarity of the cell is the issue. Where is the top, where is the bottom, where are front and back? Only when the cell is polarized in the right way can it change to adhere to the particular shape of an organ or tissue. "Almost twenty years ago, my first PhD-student found an interesting, unnamed gene, which likely participated in cell polarity," says Prof. Andreas Wodarz PhD, Institute for Anatomy and Cell Biology, Georg-August-University Göttingen, Göttingen, Germany and the Institute for Genetics, Heinrich-Heine-University Düsseldorf, Düsseldorf, Germany and The Cluster of Excellence Cellular Stress Responses in Aging-Associated Diseases (CECAD), one of two Clusters of Excellence at the University of Cologne. At first, polarity tests on this gene were promising - even though it turned out to be highly subject to mutations. In the beginning, the newly identified gene seemed to code for a mid-sized protein of about 900 amino acids. But over time, it became clear the gene was much bigger and held information for a protein almost twice that size. Although it was possible to knock out this protein in the fly drosophila - surprisingly, the mutated flies lived. "Most of the genes important for polarity are essential and organisms without them cannot live. Because tests result did not fit our expectations, the gene ended up in a "drawer" [forgotten] for a while," Wodarz explains. Almost ten years thereafter, doctoral candidate Hamze Beati conducted experiments on the gene providing the first hints of how it functioned. Beati produced a transgenic strain of fruit flies with excess protein from this gene in their cells — with an astonishing outcome. The cells changed shape, contracting at their tops when observed from above, and looking significantly smaller — spawning the name "smallish." But, even as this 'smallish' size producing protein greatly influenced the shape of cells, mutant flies with the gene did not die. How come? Irina Peek, a doctoral student and co-first author of the new work, made a breakthrough discovery in 2016. She found the reason flies are able to live with the 'smallish' gene knocked out, is the storage of functioning smallish-proteins kept within the egg. In mutant embryos where the mother was the mutant and unable to store proteins in her eggs, cell shape was way out of control. "Smallish is important for the correct shape of cells. In embryos completely missing "smallish", we see that cells are loose and do not have cell wall tension anymore. These cells are unable to perform coordinated cell shape changes, essential to shape generation. In upcoming experiments, researchers want to investigate how smallish interacts with other proteins, how it gets to the right place in the cell, and how it influences cell shape. One thing is for sure, smallish will not be put back in the drawer anytime soon." The gene controlling cell polarity is not only interesting to basic research, according to Andreas Wodarz PhD: "The gene is highly conserved across evolution, which means it can be found in similar forms in many organisms. The human homolog LMO7 is known as a tumor suppressor. Reduced amounts of LMO7 are known in a range of tumors, which indicates a role in the growth control of tumors." Polarity in cells is controlled by a relatively small group of genes, almost unchanged in all higher animals over millions of years. The work is published in the Journal of Cell Biology January, 2018. In epithelia, cells adhere to each other in a dynamic fashion, allowing the cells to change their shape and move along each other during morphogenesis. The regulation of adhesion occurs at the belt-shaped adherens junction, the zonula adherens (ZA). Formation of the ZA depends on components of the Par–atypical PKC (Par-aPKC) complex of polarity regulators. We have identified the Lin11, Isl-1, Mec-3 (LIM) protein Smallish (Smash), the orthologue of vertebrate LMO7, as a binding partner of Bazooka/Par-3 (Baz), a core component of the Par-aPKC complex. Smash also binds to Canoe/Afadin and the tyrosine kinase Src42A and localizes to the ZA in a planar polarized fashion. Animals lacking Smash show loss of planar cell polarity (PCP) in the embryonic epidermis and reduced cell bond tension, leading to severe defects during embryonic morphogenesis of epithelial tissues and organs. Overexpression of Smash causes apical constriction of epithelial cells. We propose that Smash is a key regulator of morphogenesis coordinating PCP and actomyosin contractility at the ZA. Authors: Hamze Beati, Irina Peek, Paulina Hordowska, Mona Honemann-Capito, Jade Glashauser, Fabian A. Renschler, Parisa Kakanj, Andreas Ramrath, Maria Leptin, Stefan Luschnig, Silke Wiesner, Andreas Wodarz. 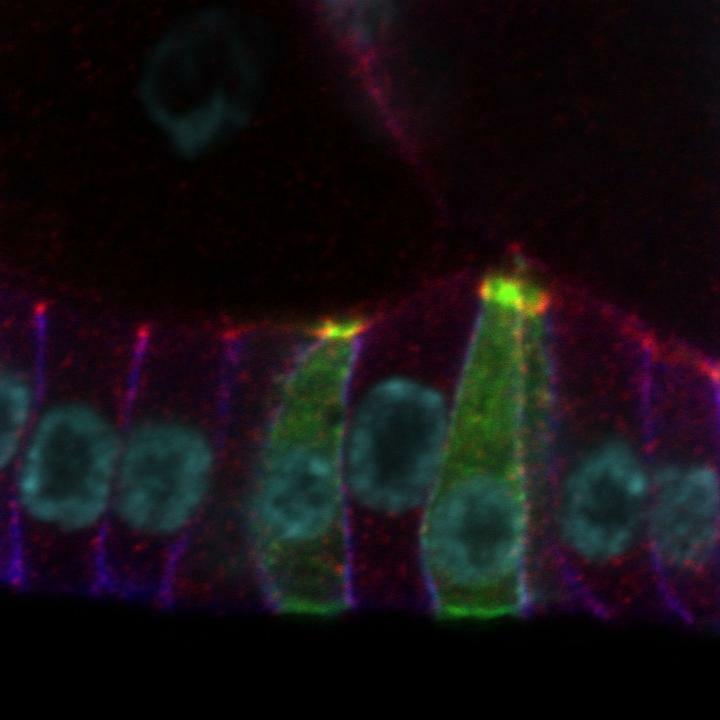 The protein Smallish (bright green) was produced in huge amounts in single cells of fruit flies, causing the cells to constrict at their upper end into a triangular shape. The image was taken at the Institute for Anatomy of Cologne University Hospital, by Irina Peek and Andreas Wodarz.